Son Heung-min of Tottenham Hotspur has seen his transfer value rise recently. According to a report by the International Centre for Sports Studies (CIES) Football Observatory released on Monday, Son was valued at 102.3 million euros or around W133.8 billion, the highest figure ever for Son since he started appearing in the CIES' rankings (US$1=W1,128). It estimates overall transfer values of professional footballers based on various elements like activity in clubs, activity in national teams, club results, goals scored, age and position. 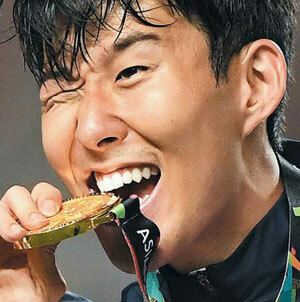 Son's value has been rising steadily, surpassing 100 million euros for the first time shortly after the Asian Games in Indonesia, where Korea won a gold medal in men's football, allowing Son to be exempt from mandatory military service. His value has more than tripled over three years, as his transfer fee was 30 million euros in 2015 when he moved to Tottenham Hotspur in the English Premier League from Bayer Leverkusen in the German Bundesliga. His value is expected to rise further as Son is now able to continue his professional career without taking a break to fulfill the military duty. His contract with the Spurs expires in May 2020.